Aero Vodochody (commonly referred to as Aero; Vodochody is a location) is a Czech (and Czechoslovak) aircraft company, active from 1919, notable for producing the L-29 Delfin, L-39 Albatros, L-59 Super Albatros and the L-159 Alca. 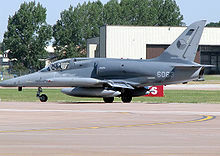 After the fall of the Communist government in Czechoslovakia (1989) and in the rest of Central Europe, the company lost a major portion of its main market in jet trainers. The sales of military aircraft declined in the early 1990s in Eastern Europe as well as in the NATO countries where the entry of a new producer was obviously unwanted. Aero was controlled for several years, 1998 to 2004, by Boeing. At the end of October 2006 Aero Vodochody was privatized once again. A Czech-Slovak investment group Penta Investments bought it for roughly 3 billion CZK. Currently, Aero Vodochody produces the Sikorsky S-76, center wing box for the Alenia C27, door subassemblies for the Embraer 170 and Embraer 190, cockpit for the the UH-60, gun bay doors for the F/A-18 Super Hornet and the L-159. Aero is also likely to upgrade the runway at its Vodochody Airport near Prague to international airport standards which would serve mainly the low-cost air-carriers and charter flights heading to Prague. Aero Vodochody Pictures and Aero Vodochody for Sale.